"Like" token, awarded by Physikerwelt. Only now I found out that in addition to <math> there is also <ce>/<chem>, which shows chemical formulas for a long time already (T98306). It should be supported in VE, like <math> is. This could be just another option inside the math dialog. E.g. after "Display" an option for "Format as chemical formula". @Amire80, pay attention: you can't use the same code for math and for ce without change it. You should add explicitly the code that checks if the input field is empty, and if it is, the result should be empty string and not empty string inbetween ce tags. If you do this, you can use it also for math, because in that case it does not matter. Here it will be a huge bug without this change. Please answer here so I'll know you read this. Thanks. 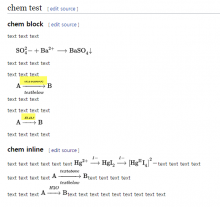 Meta-comment: First, <ce> will soon change to <chem>. See T153606. So I'll use <chem> from here on. I read this, but I'm not sure that I understand entirely. Basically, what you want is that if I add a <math>, don't type anything, and insert, nothing should be inserted? Or <math></math>? And is it different for <chem>? We are currently splitting the code for inserting and editing <math> and <chem> elements. We'll put the common parts in one class, but everything that has to be separate, will be separate. If you have comments about it, they will be very appreciated. The code for "' input that looks like "<math></math>" is fine. The code for "' input that looks like "" is fine. You can choose any of them. The code for "" input that looks like "<chem></chem>" is wrong. if inpuvar="" return "" else return "<chem>" + inputvar + "</chem>"
Oh, I got it, thank you. Empty <math> gets rendered as nothing, and empty <ce> gets renders as pointless displaystyle ce, etc. Is this what you're talking about? I guess that typing nothing should probably insert nothing in both cases, but I'll check with real VisualEditor designers and developers (this particular thing here is just something I do for fun :) ). Exactly, @Amire80. 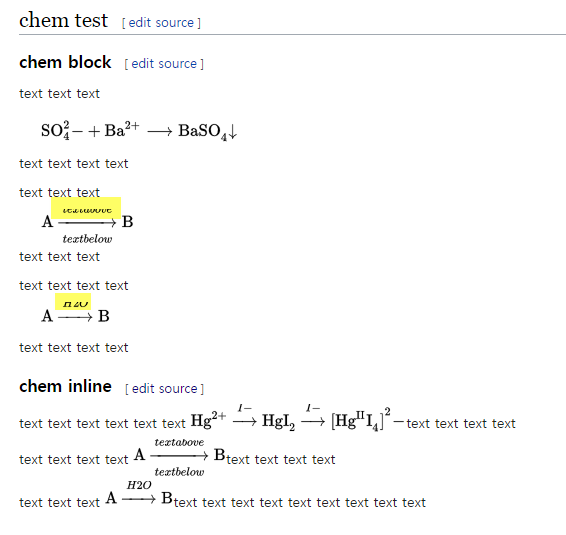 I saw that when implemented the chemical tag in wikieditor. I even am not sure that you can see the bug anywhere except Firefox undoing mechanism. But it's enough to implement it. And better now, before the deployment, and not fix it later. Esanders renamed this task from Support the <ce> tag for chemical formula in VisualEditor to Support the <ce>/<chem> tag for chemical formula in VisualEditor. Esanders added a subscriber: Dvorapa. Jdforrester-WMF set the point value for this task to 8. Jdforrester-WMF assigned this task to Amire80. Jdforrester-WMF edited projects, added User-notice; removed Patch-For-Review. I'm very happy to know that VE going to suppoprt chem formula. Thank you. I just want to report a bug. In block mode, Big chemical formula don't display properly. page to which you linked looks correct, but I might be missing something. I just want to report a bug. This is screenshot. look yellow boxes. I'm a newbie here. I don't know how to "report separate bug". so can you do that?